Bill Shakespeare (Matthew Boynton) is an unsuccessful musician in 16th century England who decides to travel to London and try his hand at playwriting. His arrival coincides with a secret operation by King Philip II of Spain (Ben Willbond) to assassinate Queen Elizabeth I (Helen McCrory) during a special peace summit. Will Bill uncover the plot in time to save the Queen and his career? Pretty much the best sketch comedy series of the past 15 to 20 years has been, somewhat surprisingly, the BBC's children's series Horrible Histories. Based on the hugely popular non-fiction books by Terry Deary, the series featured a stunning ensemble cast of actors: Boynton, Willbond, Simon Farnaby, Martha Howe-Douglas, Jim Howick, Laurence Rickard. The cast remained with the series for five seasons before quitting together to develop other comedy projects, including the fantasy comedy Yonderland and this Shakespeare-centric period satire. For all intents and purposes this film can be considered Horrible Histories: The Movie. It lacks the participation of Terry Deary but was produced in part by BBC Films and retains the exact tone and humour of the television sketches. That is both a positive and a negative. It's certainly a hugely funny movie with a great range of jokes, gags and humorous characters, but it also never quite escapes feeling like an extended TV sketch. There is always a tension in a comedy feature between telling great jokes and telling a great story, and in this case Bill certainly favours the jokes over the narrative. Thankfully they are great jokes, ranging from simple pratfalls and physical schtick to wordplay, historical satire, character comedy, and even some gags that will only work for people well familiar with Elizabethan England or Shakespearean theatre. It is a deliberate all-ages film in the best sense of the word: it's easily suitable for children, but at the same time it is sophisticated enough to entertain a lot of adults. The cast are all tremendously talented comic actors, but in this case the real standouts are Matthew Boynton as the credulous, somewhat self-centred Shakespeare and Ben Willbond as the arrogant, over-the-top King Phillip - a character he played extensively back in Horrible Histories. Sadly Martha Howe-Douglas, a hugely talented actress who did a phenomenal Elizabeth I for Horrible Histories, is relegated to supporting roles here including Shakespeare's wife Anne Hathaway. In her place is Helen McCrory, who simply is not half an entertaining. It is a weird choice. 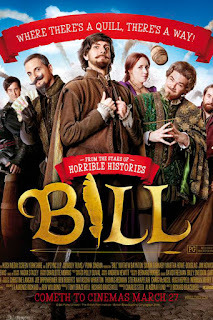 In many respects Bill is simply too similar a project to Horrible Histories to have made an huge impact of viewers, and I was more impressed by the team's strange Mighty Boosh-meets-Labyrinth series Yonderland. The jokes are often tremendously funny, if the ultimate point of a comedy is to make its audience laugh, then Bill is certainly a big success. If, on the other hand, a good film deserves a more solid narrative structure and fresher ideas, then Bill does come up a little short.